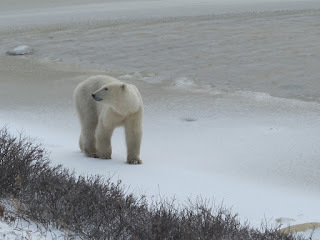 Eminent polar bear scientist and author Dr. Ian Stirling is appearing at The Fairmont Winnipeg on Nov. 16, 2011 at 6:30 PM for a presentation and book signing. Sponsored by Polar Bears International, the world's leading polar bear conservation group, the event in the East Ballroom includes a book signing, hors d'oeuvres and wine. Stirling will autograph copies of his new book, Polar Bears: The Natural History of a Threatened Species. Tickets are $40, and reservations may be made online. On a lighter note, The Lounge at The Fairmont Winnipeg is serving a special polar bear drink from Nov. 12-19, 2011. The Canadian Polar Bear 'Teani ($11) is made with Ice Cold Polar Bear Vodka, Chilled Antioxidant Green Tea, Manitoba Honey and Fresh Lime. The Fairmont Winnipeg is donating $1 from each drink to Polar Bears International.